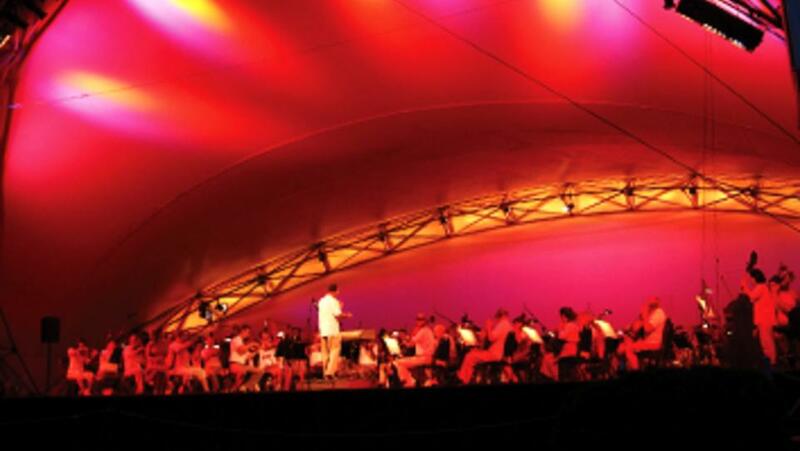 Hamilton County, Indiana plays host to several awesome music venues but nothing beats the beautiful outdoor amphitheater at Conner Prairie, host of the Kroger Symphony on the Prairie series. The summer weekends are packed with an awesome lineup of Indianapolis Symphony Orchestra and guest performances. This year marks the 35th anniversary of this delightful gathering of music, friends and food. 1. All Kroger Symphony on the Prairie concerts begin at 8 p.m. unless otherwise noted. Gates open at 6 p.m. Gates open early at 4:30 p.m. on July 2, 3 & 4 and 5 p.m. on Sunday, August 30. All programming and artists are subject to change. 2. There are two seating options when buying tickets: general admission lawn or table seating (directly in front of the stage). Save up to 35 percent when you purchase a 10-Ticket Value Pack, valid for any performance! Act fast — this deal is only available through July 1. Purchase tickets online at ISO or at any one of Kroger&apos;s 21 participating locations (TIP: use your Kroger Plus Card for a discount on tickets). 3. Accessible parking is available with golf cart transportation to and from the gates. Contact the Hilbert Circle Theatre Box Office for more information. 4. Tut tut, looks like rain! The ISO and its guest artists make every attempt to perform, even in rainy weather. In the event of severe weather that might cancel a concert, you will be invited back. Rain checks will be distributed and will admit ticket holders for lawn seating to any remaining Symphony on the Prairie concert. Replacement table seating is arranged through the Hilbert Circle Theatre Box Office and is subject to availability. Valid rain checks will be confirmed the day after the cancellation on the ISO website. Concert cancellations due to weather are reported via the ISO&apos;s weather hotline at 317-758-SOTP, Facebook page and Twitter feed. "Like" the ISO on Facebook and follow @Indy_Symphony on Twitter for up-to-date concert information. 5. For larger groups requiring a private area, call Conner Prairie to rent one of three picnic pavilions. The sales and catering team will help secure the right pavilion for your group size and coordinate meal and beverage servicing. Pavilion rentals require catering from Conner Prairie. Picnic-style foods are best for this event. Some of our favorites: chicken salad on croissants, frozen grapes, chocolate covered strawberries, wine, cheese and crackers. There are also concessions if this is a last minute activity. Glow-sticks or night toys for the kids to play with as they get restless. The hills on either side are great for the kids to run up and down. Bring folding chairs and a vinyl tablecloth to place under a blanket to eliminate dampness. Some guests bring small tables for their meals and others have umbrellas to shield the sun. Bring a wagon or a rolling cooler. If neither is available, the Boy Scouts have wagons to help you move things from your car. Pack everything in backpacks and a bike trailer and ride your bike if possible. This will eliminate waiting in long lines to park and the trailer is a great place for the kids to play. Pets, grills, large tables, large umbrellas, tents, firearms, fireworks, tiki torches or sparklers are not permitted. Tag us on social using #VisitHC / @VisitHamiltonCo and #SOTP / @indy_symphony with your summer concert photos at Symphony on the Prairie. Rock on!